90 days. Cucurbita moschata. Open Pollinated. 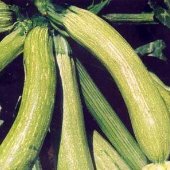 Plant produces good yields of yellowish-green squash. Great frying and grilling variety. Excellent choice for home gardens and specialty market growers. A variety from Italy. A summer squash variety.